THE following media releases, issued yesterday, are reproduced here without alteration. I wonder whether the Deputy Premier and Local Government Minister is aware of the irony in his proposal to strengthen democracy by deferring this year's council elections and reducing the number of future elections by half. The Deputy Premier, Bryan Green MP, today announced that Local Government elections will be deferred until next year and voting for all councils will be compulsory. Mr Green said the Government had also decided on all-in, all-out four year terms for councils and popularly elected Mayors and Deputy Mayors. The changes will take affect at council elections in October next year. "Introducing these reforms will minimise confusion while giving voters time to adjust to the changes," Mr Green said. "The Government wants to give everyone the opportunity to participate in our democracy and ensure councils are even more responsive to their communities. Rather than elections for half the council every two years these reforms will provide continuity for our leaders in local government and the communities they represent. All-in, all-out council elections, compulsory postal voting and an end to dual representation are about ensuring our democracy is strong and works well. Mr Green said the Government had decided to proceed with the reforms following further public consultation. "Over the last few weeks I have received feedback from the Local Government sector and the public regarding the proposed changes to the electoral system for Local Government. It makes sense to introduce the reforms as soon as possible, and that is next year. Mr Green said Mayors overwhelmingly supported postponing the elections. "Compulsory voting for all councils was always the State Government's preferred option and this was reinforced by concerns expressed about the proposed opt-in system. I appreciate all the comments received on the proposed changes and now look forward to delivering these important reforms. Mr Green said he expected to introduce Legislation to Parliament next month and urged the Liberal Party to support the changes. "The Liberals have been negative about the reforms but they should not be fearful of more people participating in local government elections. It is encouraging to see widespread support across local government for these changes and the Liberal Party should now play a more positive and constructive role," Mr Green said. The Tasmanian Greens today welcomed the Minister for Local Government, Bryan Green MP’s announcements on local government reform, saying they are significant planks in strengthening Tasmania’s democracy. Greens Local Government spokesperson Tim Morris MP said that less elections, with all councillors facing the voters at once, and an end to dual-representation would increase accountability as well as lead to more accurate representation and was a win for the Tasmanian community. “The Greens have long advocated an end to dual representation, where one person holds a seat in both local council and State Parliament, and we successfully established in 2011 a Parliamentary Committee inquiry into introducing compulsory voting for local government,” Mr Morris said. “Dual representation has always been a matter that the Greens have campaigned to have reformed, to ensure that voters get value for their vote. Holding a seat at any level of government is a demanding role and I can’t see how someone can commit the time and effort necessary to meet the standard that the public deserves if they are sitting on two levels of Government,” Mr Morris said. TODAY was the Derwent Valley Council's 150th birthday. The date marks the anniversary of the first election and first meeting of the then Rural Municipality of New Norfolk, both of which were held on March 18, 1863. Events like this remind me again of the rich history of our part of the world and how much has been achieved in the 205 years since the first European settlers made their way up the River Derwent to what is now New Norfolk. Our council is not perfect but it is ours, and we have the people of 1863 to thank for that. 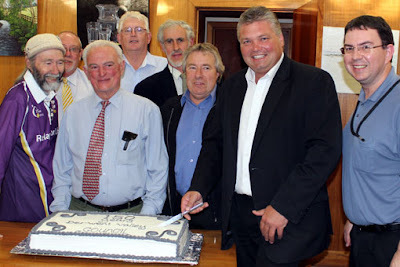 By sheer coincidence, today's anniversary coincided with a special council meeting for the purpose of determining the council's position on the agenda items for the next meeting of the Local Government Association of Tasmania. This in itself is one of the improvements made by the present council. Three years ago the mayor of the day decided on these matters himself. Special meetings have a fixed agenda that do not provide much scope for events like a council's 150th anniversary, but with councillors' support I moved to suspend so much of standing orders as was necessary to permit the mayor to acknowledge the day's special significance. A cake was cut and shared with the public gallery, photos were taken and then it was down to business. Cr James Graham, general manager Stephen Mackey, Deputy Mayor Barry Lathey, Cr Wayne Shoobridge, Cr Tony Nicholson, Cr Chris Lester, Mayor Martyn Evans and yours truly at tonight's 150th anniversary council meeting.